Last week I posted my thoughts about Preaching from the Lectionary. I ended that article by saying that not only did this Baptist preacher take his text from the revised common lectionary, but I also preached in a robe. Well, the robe-thing apparently intrigued a couple of readers who asked that I elaborate. I like wearing a robe. Mine is a black academic gown with black velvet panels — very plain, but nice. About 20-years ago I started wearing a black robe for weddings, which eliminates having to be fitted for a tux. 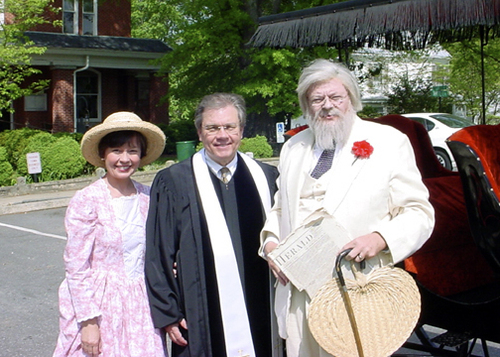 I had worn robes on special occasions, but never regularly until 2003, when I was the interim pastor of a United Methodist church. They wanted me to wear a robe, and I wore one every Sunday. A minister’s robe fits our worship. Okay, this is where I start to get serious. We worship in an old Victorian Gothic sanctuary built in 1890. We have a pipe organ and choir in a real loft (8-feet above the pulpit), and our worship style is Virginia traditional. Lots of Baptist preachers in Virginia wear robes, which might be a holdover from Virginia’s Episcopal past. We observe the Christian Year. The stoles of different colors — white, red, purple, and green — that I wear on appropriate Sundays help us mark the passing of the Christian Year. Our church likes for the pastor to wear a robe. If the church objected, I wouldn’t wear a robe. But several church members suggested that I renew a practice followed by several former pastors. So, there you are — my five reasons for wearing a robe. There may be more, but that’s probably enough for a Sunday night. It is a uniform of sorts that communicates something. I hear, in the liturgical tradition, the priest is a symbol of Christ. When the priest is present, so to speak, Christ is present. All of this is metaphorical, of course, but isn’t that the point?